Deontay Wilder has a luxury, if you can call being thrown into a ring with a 6-foot-9, 260-pound man who is hellbent upon punching you in the face a luxury. Wilder doesn't have to win the first round. Or the second or the third or the fourth, or any round that comes after it. He is one of the most pure knockout punchers active in boxing and all he needs, literally, is one punch to win. The WBC heavyweight champion has knocked out every man he's faced. Bermane Stiverne is the only opponent to go the distance with him, but in their rematch, Stiverne was violently finished in the first round. 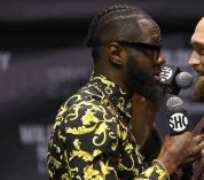 • He needs to defeat lineal champion Tyson Fury when they meet Saturday in a Showtime Pay-Per-View blockbuster at Staples Center in Los Angeles to swat away the legion of critics who claim his perfect record is a result of hapless opposition. • He needs an impressive result against the 27-0 Fury to better position himself for the sure-to-be difficult negotiations for a unification bout next year against IBF-WBA-WBO champion Anthony Joshua . The fight is the classic match which pits Wilder, the violent slugger, against Fury, the slick and supreme boxer. There may never have been in the history of boxing a man with the size of Fury who moves as effortlessly and boxes as beautifully. Wladimir Klitschko was regarded as an unbeatable giant during his nearly decade long reign atop the sport, but Fury is three inches taller with a four-inch longer reach. Two things are all but certain in the fight. Fury will incessantly pop that left hand in Wilder's face, and Wilder will throw that windmill right hand repeatedly. Wilder faces a simple task, though it may not be so simple to accomplish. “It's a simple game and it's a lost art from years ago,” said former heavyweight contender Gerry Cooney. “He's got to get past the jab. Here's the deal: Fury doesn't have a physical jab like [Larry] Holmes had or I had, but he's got a long arm that he sticks out there. He's going to be sticking it out there all night long. Wilder was uncomfortable in his March victory over Luis Ortiz. Ortiz, who came into the fight with the reputation as a slugger, boxed wonderfully for much of the fight, and he was able to keep Wilder off-balance. Wilder showed something in that fight, though, that is the mark of an elite fighter: He responded to extreme adversity and he found a way to win even when things were going badly against him. In the fifth round, Wilder dropped Ortiz, but Ortiz got up and came back to fight well, something Wilder wasn't used to have happen to him. In the seventh, Ortiz rocked Wilder and poured it on. Wilder was on very unsteady legs and looked at least for a moment like he may be stopped. He still found a way to win, and that memory should help him. It's likely that Fury will be ahead on the scorecards throughout the fight. He figures to be the busier guy, giving angles and turning Wilder, neutralizing that big right. Ben Davison, Fury's trainer, said that knockdown will actually work in Fury's favor. Cunningham has had a good career, but he doesn't punch remotely as hard as Wilder. With Wilder, there are very rarely second chances. Ortiz made it back to compete after the first knockdown, but he is an obvious rarity. That seems like it will be the difference in the fight. Wilder has a lot larger margin for error. He can make mistakes and it's unlikely Fury will finish him. But if Fury makes a mistake, the fight will be over in an instant. Fury's almost certainly going to be ahead on the cards whenever it ends, but Wilder's eventually going to find a way to land that right hand. When it finds its home, Wilder will win by knockout and become the lineal champion. It's going to take a while, so say Wilder by TKO in the tenth round.